John Doyle’s signature minimalism fails to amplify the storytelling in this revival of Marc Blitzstein’s satirical play in music. Lane Williamson reviews. Earlier in the season, Classic Stage Company mounted a revival of Bertolt Brecht’s The Resistible Rise of Arturo Ui, a Hitler-metaphor play that, in today’s climate, turned into a Trump-metaphor play. The parallel relevance was astounding at times; director John Doyle and his actors dusted off a play from almost eighty years ago and made it seem brand new. It’s possible that Doyle saw some relevance in Marc Blitzstein’s allegorical “play in music”, The Cradle Will Rock, given our unequal distribution of wealth and our president who was elected, in part, because he presents himself as a self-made billionaire. Cradle is concerned with the working class of “Steeltown, USA” and their attempts to get out from under the thumb of the controlling Mr. Mister who essentially owns everything. Doyle may also have seen some connections in the fact that the original production was temporarily shut down by the WPA due to union issues. It’s a stretch, but that could be extrapolated to our contemporary fear that the government will start controlling the art we consume. The contemporary relevance is tenuous at best and Doyle’s production does not go any further in clarifying it. True to form, Doyle employs his signature minimalist aesthetic, but here the spareness does not amplify the storytelling, as is often the case. It’s not that the shuffling of oil barrels into different configurations makes it confusing to discern the various physical locations, it’s that the nondescript design strips perspective from the characters. By dressing them all in similar factory-worker garb, Ann Hould-Ward has leveled the playing field in a story all about an uneven distribution of wealth and power. By putting the characters in neutral spaces, Doyle has removed anything that distinguishes the piece as satire. Blitzstein’s songs are all performed with the same rousing drive and they blend together until they’re numbing. By the time Tony Yazbeck leads the title song towards the end, it doesn’t inspire a wave of collective support in the union, it’s just another blip on the radar. That’s no fault of Yazbeck’s who turns in another in a string of phenomenal performances. Yazbeck has an overwhelming presence that accompanies him whenever he enters a stage. He’s a man of the theatre, the truest triple threat, and even here, where he doesn’t dance at all, his physical being exudes confidence and charm. Yazbeck plays two characters, one a defeated druggist and one the leader of the union, and both are drawn with the intensity and specificity needed to break free of the production’s bland trappings. Lara Pulver’s performance as The Moll pushes at these aesthetic strongholds, too, but she is unable to transgress them as successfully as Yazbeck. This is mostly due to her character, a downtrodden prostitute who lacks the rallying force of Yazbeck’s Larry Foreman. But when The Moll finds herself awaiting her sentence in night court and sings one of the show’s most famous songs, “Nickel Under Your Foot”, Pulver imbues both the song and its preceding monologue with a soft ache that brings a glimpse at the humanity under Blitzstein’s aggressive score. The natural talent and intelligent, layered characterizations that Yazbeck and Pulver bring to their performances are unable to pull the production from its rut, though. A running visual metaphor where heaps of money are stuffed in pockets and hungrily snatched from the floor is too on-the-nose. The world Blitzstein has created is smarter than something so obvious. We know it’s about greed without seeing everyone drool over dollar bills. 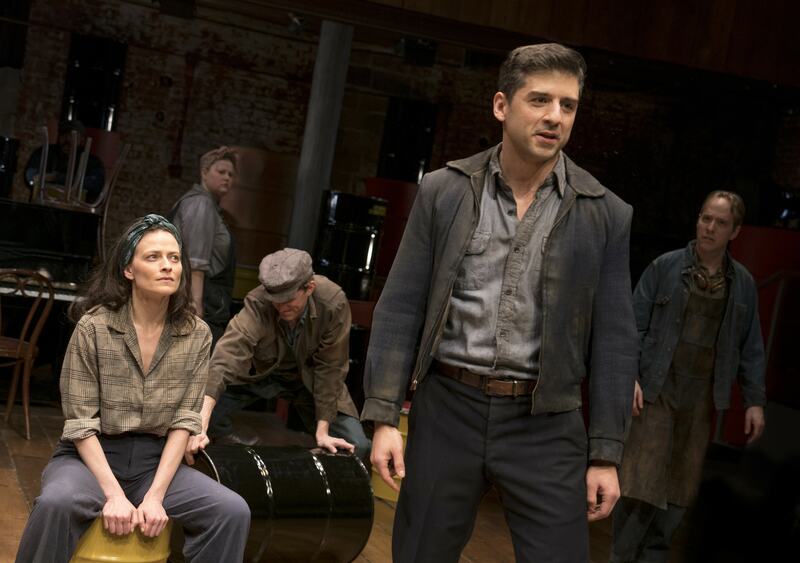 Blitzstein uses the Brechtian tools of alienation to tell the story of Steeltown, USA and its controlling overlord through character monikers that indicate their position in the workforce and through the kind of declamatory, thumping political music Kurt Weill wrote to Brecht’s lyrics. Doyle’s directorial style also depends on Brecht’s influence, eschewing naturalism for an exaggerated performativity that separates the actor from the character, the character from the audience. It worked well in Doyle’s Arturo Ui, but here the characters come from an erased page. There’s not enough to show us what’s happening, so there’s little investment. The minimalism is too minimal.